Have you checked your calendar? Thanksgiving is just a few short weeks away, and I bet for most of us, the time is going to fly faster than we wish. 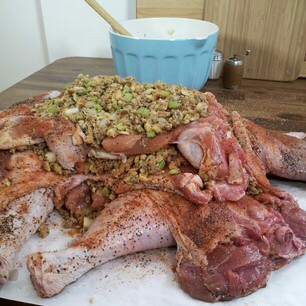 This year, I wanted to share with you a fun and quite-impressive-looking project I worked on with Allrecipes.com – Thanksgiving Cornucopia! 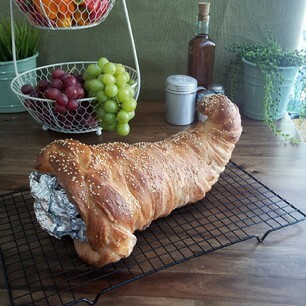 You make the cornucopia using refrigerated bread stick dough, bake it to a glistening golden brown color and fill it with your favorite ingredients. Best part? This is an edible centerpiece that you and your family can enjoy the following meal if you have any room left in your stomach after the Thanksgiving meal. Brussels sprouts! I am in love with these mini-cabbage full of vitamins and nutrients. They have been making an appearance on my Thanksgiving table for quite a few years. This year, rather than coming in a mesh bag, cut up from their stalk, the brussels sprouts arrived from the store attached to their stalks, looking regal and proud. 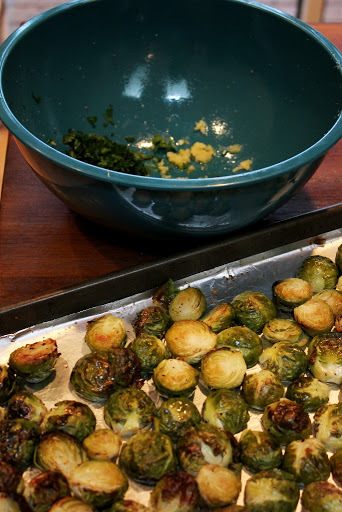 When it came to Thanksgiving, I chose to deal with each of the stalks separately – roasting the brussels sprouts from one of them as I have in the past – cutting them off, halving, and drizzling with oil. 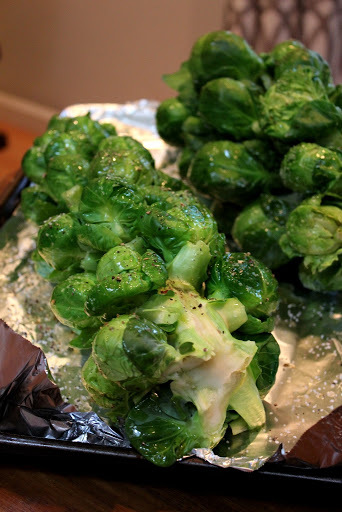 The other stalk was an experiment – my first time roasting the brussels sprouts whole, attached to the stalk. Both ways were delicious in their own ways. Try each one and let me know your favorite. 2. Drizzle brussels sprouts with olive oil and season with salt and pepper. 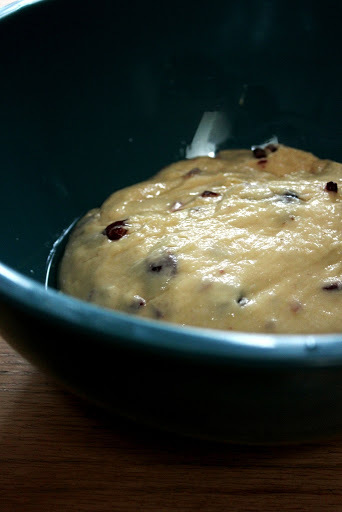 Spread in one layer on a cookie sheet. 3. Roast brussels sprouts in the oven for 30-40 minutes turning halfway through. 4. Toss roasted brussels sprouts with parsley, garlic, lemon juice and lemon zest. 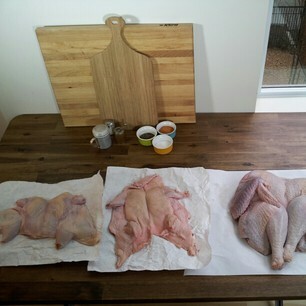 Season with additional olive oil, salt and pepper, if desired. 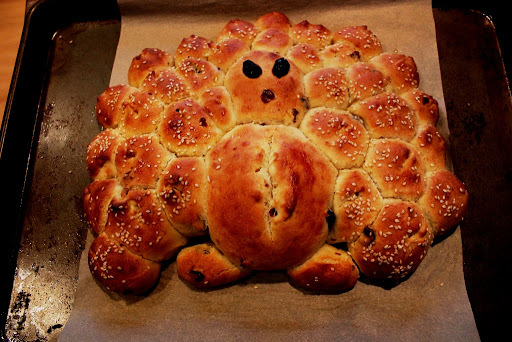 Ready for another recipe? 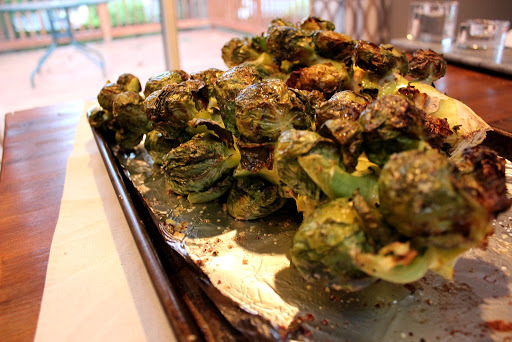 Try Whole Roasted Brussels Sprouts! 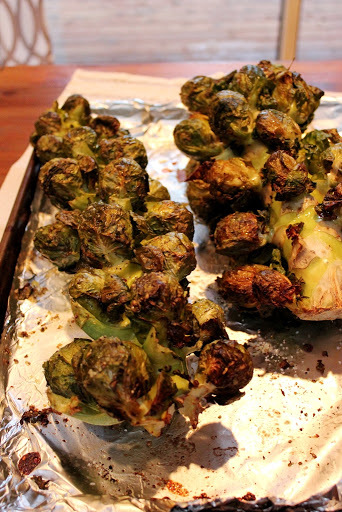 Have you ever tried roasting brussels sprouts directly on the stalk? It’s easier than you might think and looks very impressive on the table. In fact, it might be the perfect conversation starter. Give it a try! 2. Wrap the brussels sprouts stalk in plastic wrap and microwave for 4-5 minutes. 3. 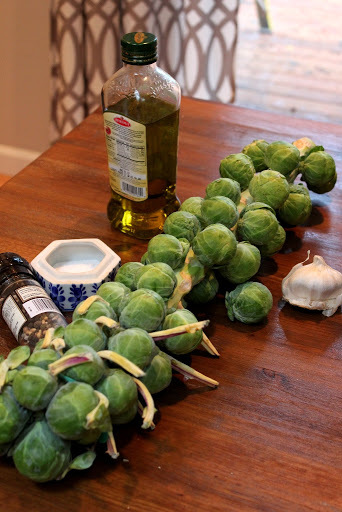 Brush the brussels sprouts with olive oil and season with salt and pepper to taste. 4. 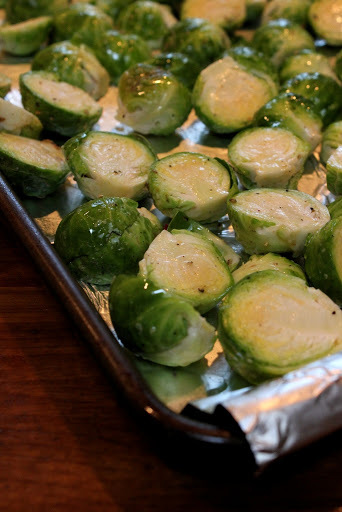 Roast in the oven for 45-60 minutes, turning halfway through, until the brussels sprouts are tender. 5. Cut off the brussels sprouts off the stalk and serve. 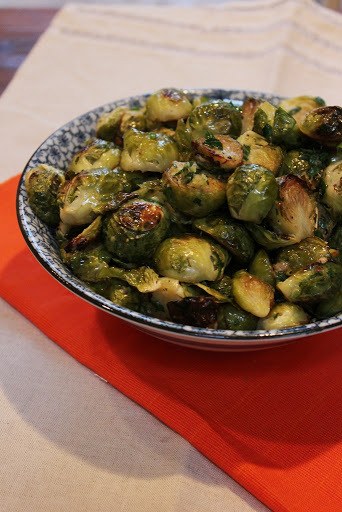 Want to try a different recipe for brussels sprouts? 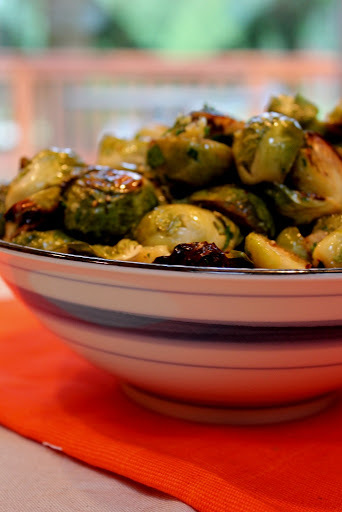 How about Roasted Brussels Sprouts with Garlic, Lemon and Parsley? Thanksgiving is just a week away. 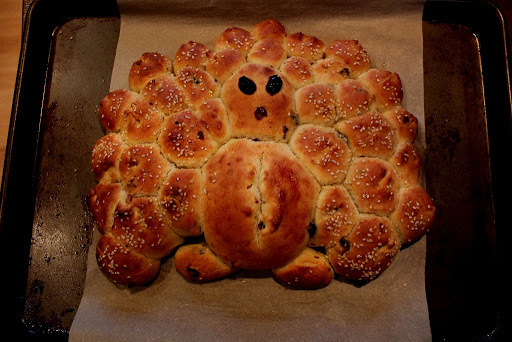 To be honest, Thanksgiving is my favorite culinary holiday (Hanukkah follows closely behind with latkes!). I experienced my first Thanksgiving as a young teenager, when my family moved to the United States. I loved the roasted turkey, despite the fact that my father does not eat the bird. I loved the mashed potatoes, welcoming them to the table welcoming them to the table like an old, familiar friend. I even loved the cranberry sauce that came directly out of the can (forgive me, this was years and years ago before I discovered how easy it is to make your own cranberry sauce). One thing that puzzled me about Thanksgiving was the Sweet Potato Pie. I didn’t get it. Please don’t judge, but I grew up without much cinnamon, five spice, and nutmeg. The flavors didn’t resonate with me. And so, I unfairly abolished sweet potatoes altogether from my diet. Then one day, I tasted sweet potatoes on their own. I should have marked that day on the calendar, it was that epic! Since then, I have been enjoying sweet potatoes on a regular basis. One year, when planning the Thanksgiving menu, I thought I should incorporate sweet potatoes in the meal, but do it my way! Here’s the recipe for Thanksgiving Zesty Sweet Potatoes with Jalapeno and Ginger. I add zest and juice of the orange, along with the lime juice to enhance the natural sweetness of sweet potatoes. The heat from the jalapeno pepper and spice from fresh ginger counteracts brown sugar and brightens up the dish. Cilantro and scallions contribute flavor, aroma, and color contrast. 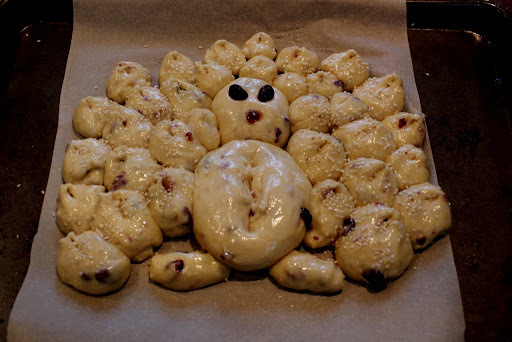 I welcome you to try this recipe and share it with your family and friends at the Thanksgiving table. 1. Place sweet potatoes in a large pot and cover with water. Season with salt. Bring the water to a boil, lower the heat and simmer sweet potatoes until they are completely tender. 2. While the potatoes are cooking, whisk together orange zest, juice, lime juice, jalapeno, brown sugar, garlic, ginger and half & half – this is your dressing. 3. Once tender, drain sweet potatoes and mash in a large bowl. Combine the potatoes with the dressing and season with salt and pepper. If you would like a looser consistency, add a little bit more half and half. Gently fold in cilantro and scallions. 4. Serve on a side, garnished with extra cilantro and scallions. If you have any leftovers the next day, I’d recommend making these potatoes into little cakes by adding an egg and flour and then pan frying the potatoes in vegetable oil. Please share your favorite non-sweet way to enjoy sweet potatoes! Check out a few more of my favorite sweet potatoes recipe: Sweet Potato Latkes and Sweet Potatoes with Coriander and Cumin. Whole Foods Market here, Whole Foods Market there, Whole Foods Market everywhere! 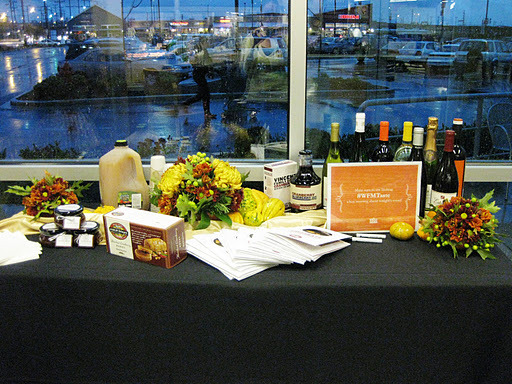 As I was going through my 2nd week as the new Culinary Director at Whole Foods Market, I received an invitation from Curator PR to attend a fun and what turned out to be delicious and educational event: Preview of Taste of Thanksgiving at Interbay Whole Foods Market. No worries – you too can taste these and more samples of what Whole Foods has to offer for your holiday table. Stop by at your local Whole Foods market this Thursday, November 4th (check the times for your location) and be ready to eat – a $5 donation will directly benefit Food Lifeline. While at the store, be sure to place your order for the holiday bird – don’t leave it till the last second. 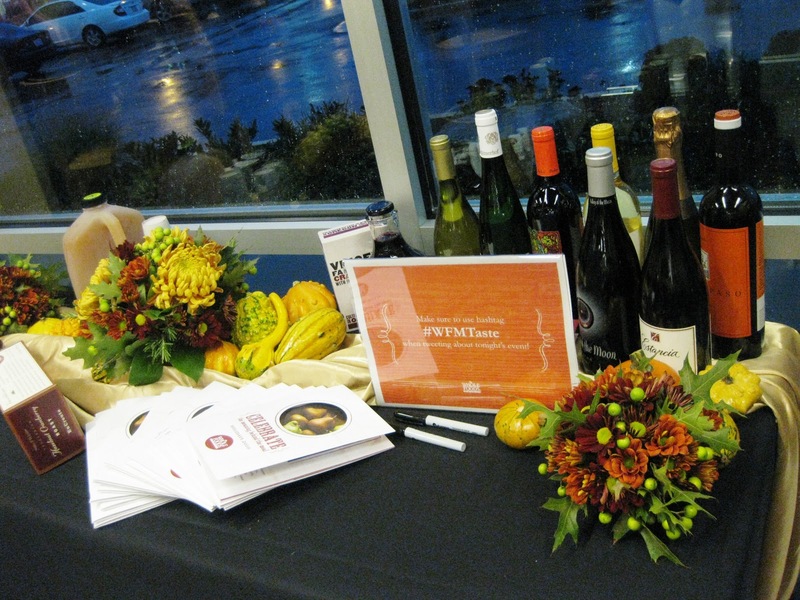 Check out “Top Ten” wine selection available exclusively at Whole Foods Market. While we didn’t get to sample the wine, we did have a pleasure of drinking apples. Sounds funny, right? Who drinks apples? But that’s exactly what you’ll feel when you take a first sip of Skagit Fresh Apple Cider. 100% apple juice. No sugar. Keep it refrigerated for up to 1 month – though I doubt it’d last more than just a few days. Drink up! The cider is a blend of three varieties of apples: johnagold, honeycrisp, and gala. Similar to wines, the actual share of juice from each apple variety can change from one gallon to the next. Penn Cove Oysters. and Lemon. on Ice. Oysters. Just like sushi or sunflower seeds, I can never quite have enough. I eat the last one, and then look at the plate in pure disbelief and my heart hurts just a little bit – there’s no more. Luckily for me, one of my table companions was allergic to the oysters, so I got a chance to slurp a few extra. 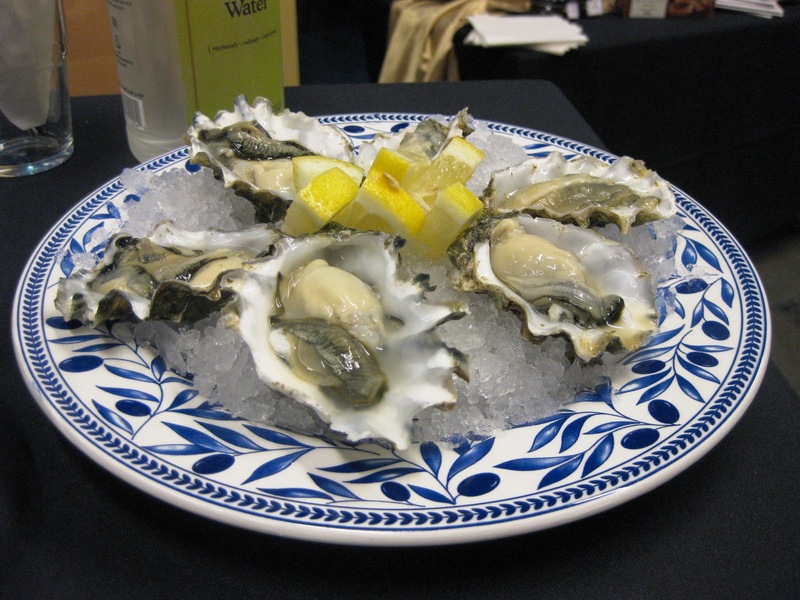 Not all oysters are created equal though – these were better than some – firm and crisp with just a bit of brininess. I would’ve liked a little bit of the mignonette, but the lemon worked ok. I love mushrooms. I love sausage. I sort of like fennel. It’s one of those flavors that I definitely have had to at first tolerate and then learn to enjoy. I’m almost there. I definitely wouldn’t eat a teaspoon of fennel seeds on their own (but who would? ), but sprinkled liberally through the sausage and then hidden inside the mushroom cap, they were a gem rather than a distraction. Hope you like the heat, because the jalapeno chorizo boats (ok, that’s what I’m calling them) are super hot/spicy/zesty/develish – you pick the word you want. 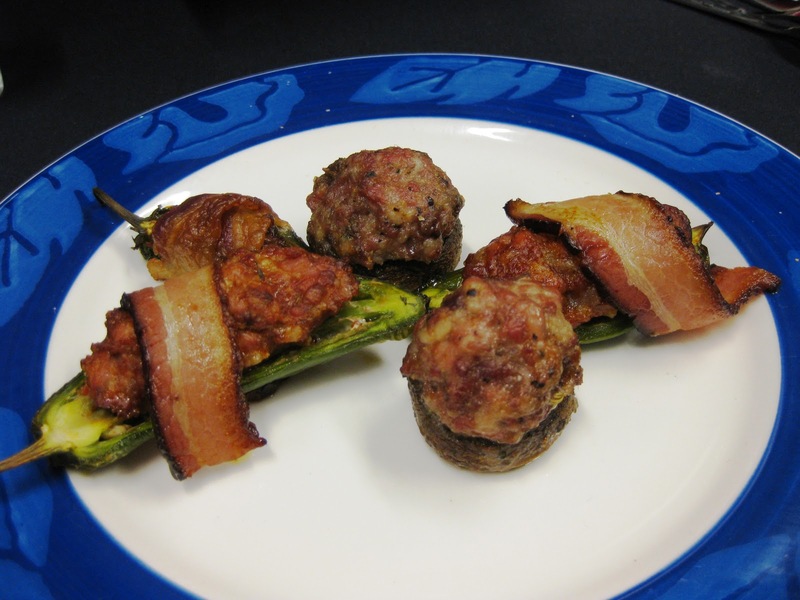 When making at home, feel free to play around and perhaps use a milder pepper as a chorizo carrier. But for someone who does like the heat, I quite enjoyed these bites. 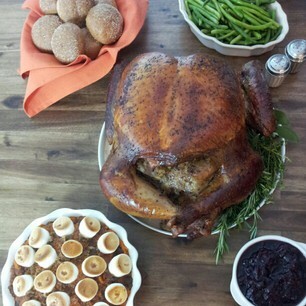 So I realized something while uploading the photos – I am missing the photo of the turkey plate! I must’ve been to distracted by the food and the conversation. Too bad. The plate was full to the brim with turkey, mashed potatoes, roasted brussel sprouts & pecans, cranberry sauce, stuffing and Field Roast (not a turkey imitation, but an option for your vegetarian and vegan friends and family). And there was a bowl of gravy. I have to say, I’ve never been a fan of sweet potato pies or pecan pies, so I clearly welcomed the idea of something different for dessert. 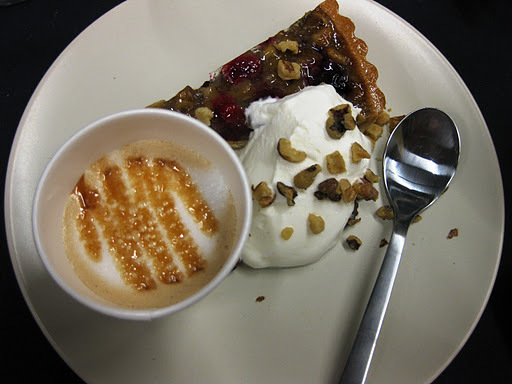 Boy, was I happy with the Cranberry Walnut Tart. What makes the tart so incredibly delicious yet simple? 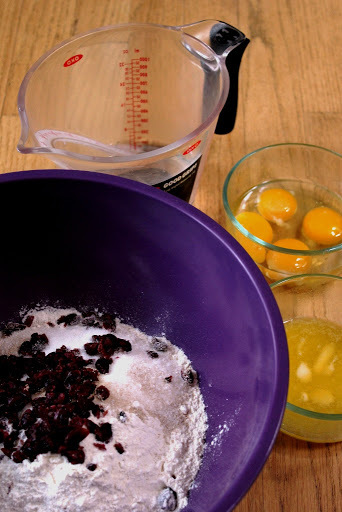 Fresh cranberries – tart and plump and juicy. Walnuts – nicely toasted inside the tart and as a garnish on top of the whipped cream dollop – they add crunch and richness to the dessert. What are your plans for this Thanksgiving dinner? What are you cooking? Who are you feeding? The focus of Whole Foods this year is to celebrate local and unique products. So head out to the store and check out a few new-to-you ingredients and products that will be welcomed guests at your table this year.